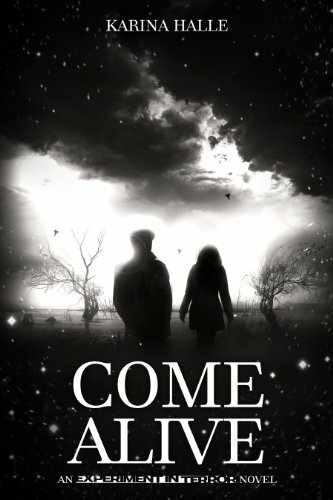 Karina Halle’s “Come Alive” (Experiment in Terror book #7) is LIVE right now!! Doin’ a happy dance, happy dance…hap-py-dannnnnnce (okay actually that was me singing and happy dancing). And, nope, I haven’t read this one yet, and YEP I need my Dex-fix. SO bad!!! Kirsten: Karina Halle’s 7th EIT book is LIVE! I loved it, go get it. Kristi: So, What’s everyone reading?? HAHAHA!!!! EIT ladies!!!!! Brenda: I was exactly the same I don’t usually read paranormal either. Ended up reading every single book in a week. Was so sleep deprived and crazy from reading them obsessively. Loved them. Best characters ever. Jeannie: You will LOVE Lying Season!!! Then you are going to rip right into On Demon Wings…..
Claudia: I’m not a paranormal fan but when I read the first book “Dark House” and met Dex I just couldn’t stop reading..the good thing was..I read 5 books back to back..lol…GOOD TIMES!!! Jeannie: Let us know what you think of Lying Season…. Ashley: Oh Lying Season was my favorite…or maybe Into the Hollow, but maybe Come Alive will be. Hell, they’re all my favorite, lets be honest! Toski: I still have not read these.. so tell me- If I have never read a lot of paranormal– Are they must reads?? Did you love them? What what whaaaaat??? Toski… Toooooskiiii!!! For real? READ THIS series!!! Kandace and Missy… y’all are only hurtin’ yourselves. Keeeeeep reeeeeadinng!!! Finish book #1 (sure sure… it’s not the best one in the series, but I liked it well enough over all – you’ll see, even that book gets pretty good… especially that cool weirdish Dex ending). But it’s once you get to book 2 and onward, that your Dex-head will really start spinning. And book #3. OMG. THAT ONE. YES! And then book #4 put me in an absolute tailspin frenzy (my FAVORITE)… #5, #6 LOVED LOVED LOVED (ohhhh YES #6 – I loved as much as #4). And now we have #7 —> Come Alive (Experiment in Terror #7). Please… I just gotta know. Has anyone not yet read this series? Anyone? ‘Cause I’m tellin’ y’all RIGHT NOW… These are going to rock your world. I’ve even written TWO (well many articles about EIT), but TWO main articles for those who are still doubting this series. The Experiment in Terror Series – Intrigued Readers Want to Know… <— this answers TWO of the most frequently asked questions. In fact, YOU are asking them right now! Is this scary? And is this series REALLY that great? You’re in a reading funk? Experiment in Terror series will FIX that. You’re needing a little “genre” jolt… a little “changeup”? Romance but with a kick? Experiment in Terror will GIVE you that!!! This series has EVERYTHING we love in our books. You want real-life characters that feel as if we know them, and “live” and breath as if they exist? Dex and Perry are those people. I mean… characters. You want a new forever “book boyfriend”? One that will last weeks, months and even a year or more since you “met” him? DEX is HIM!!! No wait. He’s mine so… OFF!! 😉 hehe. You guys. Please. Pleeeeeease believe me. So many of my fellow readers have jumped right in with gusto and loved every minute of these books as much as I have. And quite a few of you have held off, not going crazy over the “terror” premise, or saying you’re not into paranaormal, or saying you couldn’t really get into the first book. Whatever the reason… let me tell you. As far as I know (and I get TONS of email/comments/messages about this series)… EVERYONE that has contacted me (lots!!) has exclaimed their undying love for this series and addiction to Dex. ‘Kay? Even those that doubted me. Even those that douted their interest in a “paranormal” series. And believe me, this is a different kind of paranormal. They’re ghost hunters, for a Youtube show! How cool is that?! The paranormal comes in waves, but SO much about this series is so very human. And have I mentioned the pining? Ohhhhhh there is delicious angsty pining that leaves you wanting more. No insta-love, but enough of the “POTENTIAL romance angle” to keep you flipping the pages and your heart pumping in your chest. Do yourself a favor, friends. Those of you looking for their next favorite series? Read this one. I saw your blog and loved Karina Halle’s Shooting Scars series, so I downloaded Darkhouse free and I fell in love right away with Dex and Perry! The books just kept getting better with each story. I am now reading Come Alive and love that it is in the Pov of Dex! The thing about this series and Karina’s writing in general is it just gets better and better. I was apprehensive about reading a paranormal book. Things that go bump in the night creep me out, but I jumped right in and have never looked back. If you have not started this series all I can say is why they hell not? The characters are intriguing and the writing is superb. I started #1 a year ago and couldn’t get into it, but after hearing so many people were loving this series I decided to power thru. And boy oh boy it is worth it! I can’t stop reading them. I am onto #5 and they are sooooooo much fun to read-although On Demon Wings is breaking my heart a little. Tell me it will get sweet again soon Maryse. I LOVE Perry and Dex so much!!! I can’t believe it is here. I am so excited I don’t know what to do with myself. I just finished Dead Sky Morning about 5 minutes ago and I’m now hooked! This is the first paranormal I’ve ever read. Love the characters. I’m starting book 4 tonight! WHEN IS IT COMING TO NOOK????????????? I am dying here!!! I haven’t read it either, I started #1, but stopped because I got so creeped out! If I watch any horror movies I wont sleep for a week… I am terrible haha! Maybe I will give it a try after I read all the Slammed books! Jennifer… I’m sure you’ll love it!! And I mean LOVE. I started this series but stopped after book #3 because I was scaring myself out of my ever loving mind. However, they were great books just needed a lighter read so I would stop seeing ghost myself.. I need to keep reading because I would like to see more Dex and where he takes things with Perry. Thanks for reminding me of the series. Come Alive is going to make you squee with delight, Maryse!! Chapter 4!!!!!!!!!!!! Lysa Solomon it takes forever to post on Nook because of Karina Halle uploading from Canada. Go to smashwords.com and download it. You will be able to open it on your Nook by selecting that format. Hope this helps! This is one of my favorite authors and series! I love everything she writes! Yes, the first book was free and I happily downloaded it. It did take longer to start since it was so different from anything I had read before. I have to say that I am a huge fan of EIT. Every book Karin has written since has been so good and scary and funny and hilarious and douchecanoe! Twatwaffle, who comes up with this? Karin’s imagination and writing styles are bar none to compare. Love Dex and Perry and the whole crew. They all are worthy of every conversation and every laugh for me. LOVED Demon Wings – that is just where everything came crashing down and really got some freak on…LOVE this series and probably wouldn’t have even tried it if it wasn’t for you MARYSE!!! You have great taste MARYSE and Karina Halle’s writing is killer!!! I have never read this series but being a fan of this blog, I know Maryse is. I do not care for YA and the only YA I have ever read was the Twilight series. Is this series YA or adult? I love paranormal. It is my favorite genre. Thank you Brandi . . . I read the preview and I am DYING!!!!!! NEED THAT BOOK!!!!! It took me a little while to get on the EIT bandwagon, but once I did I couldn’t get enough. I told my book buddy that she HAD to read this series before BB and she devoured all 6.5 books in 2 weeks. I can’t wait to dig into book 7!! Dex….Swooooooooon! Thank you, Maryse! I would never have read the EIT series if not for you and your blog. I read the first book over a year ago and have been a major fan girl of everything Karina has written since. Did Karina do a shout in the book..their this character called Maryse… 🙂 so cool!! I have a nook so I downloaded the kindle app on my computer to get to this book today! I am blown away! I knew it was going to be good…come on it’s in Dex’s POV. WAIT…pause…Dex….sigh…. But….you ever just sit there and shake your head and not know what to say? I am there. Absolutely Amazing .. can’t wait to read this one. The series that has it ALL in spades !! Enjoy. I downloaded the first book a year ago and didn’t even get 10% in. There is just always something that grabs me more. I’m going to do it though. I’m jumping in and finishing the first book. I don’t want to miss out anymore! Well, say no more Maryse! I am one of those who have not really read any paranormal (not including Twilight series)…..so i just 1-clicked the first four books because I TRUST YOU THAT MUCH!! Can’t wait to start them – looking forward to something different! Maryse, No I have not read this EIT series. For some reason, just doesn’t look that good to me, and yes, I have heard all the good stuff about Dex. Guess I am not that into paranormal. Someone come up with a good reason for me and I will try book one. Haha Julie! You are funny…one good reason would be that book #1 is free right now on Kindle! I am 50% in and forced myself to take a break so that I can draw it out…. Thank you, thank you, thank you for these books, Maryse! I was one of those people who insisted that I didn’t do paranormal, but I took a chance based on your recommendation and now I am hooked. I LOVE Dex, almost as much as Kellan Kyle. 😉 These are some of my faves, for sure! Just started the Experiment in Terror series Sunday and I am starting book 3, totally hooked! I had passed on this when you previously recommended it because I thought it was some kind of predator/captive book or that Dex and Perry were both guys! Didn’t realize that it was paranormal with a great couple and a guy who ranks up there with Travis. Thanks so much! I read this in one day and I not only do I still love Dex I love him more!!! I wish the next book was in his point of view as well, he’s so raunchy and fun!! Love EIT! I can’t get enough of Perry and Dex. They have everything, humor, terror, and Dex, who is such a complex guy. He is one of the sexiest, funniest book characters ever. And Perry is so relatable. If anyone hasn’t tried the series yet they have to. So seriously!